Rural Action’s 2009 Annual Meeting is just over one week away! We wanted to take this opportunity to encourage all of our friends, supporters, and members to come out for the evening on Friday, May 8 to hear a keynote address from renowned agricultural scholar Wes Jackson, congratulate the winners of our 2009 Sustainability Awards, and support sustainable development in Appalachian Ohio. At Rural Action, we feel it is important to lift up positive examples of sustainable lifestyles. By following such examples, we can grow and strengthen the communities in our region. With that in mind, we wanted to recognize the winners of the 2009 Sustainability Awards ahead of time - and to thank everyone that took part in the nomination process. These awards are a chance for us to recognize individuals, businesses, and organizations that are helping to build better communities through their lifestyle, sustainable business practices, or professional efforts. So, come out and congratulate your neighbors for their good work in our region! Also, a reminder that this meeting will be free and open to the public, and light refreshments will be provided. 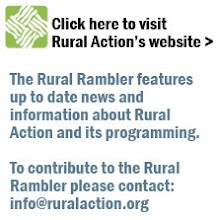 For more information, please visit our website (www.ruralaction.org). You can also contact Calaina Goodyear (cgoodyear@ruralaction.org) or call our offices with any questions (740.767.4938). Am new to blogging. So would like to know more about blogs.